I had a feeling right from the start that this baby might arrive early. It was founded on nothing, so I didn’t exactly prepare for it. In fact we were right on track for a much more organised home birth than we’d managed the last time – birth pool, candles, the perfect soundtrack bound to deep relaxation thanks to several months of pregnancy yoga. It didn’t quite work out like that, though – and much as I was taken by surprise when my waters broke at 6am a full month before our baby was due there was a sense deep in my gut that this was the way it was supposed to be. 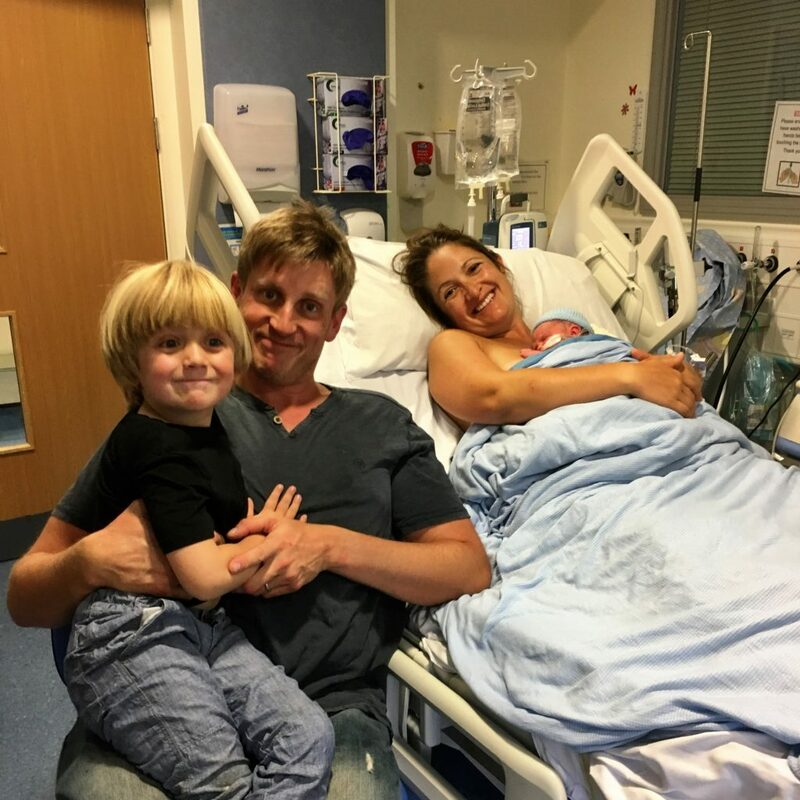 We knew a home birth was out of the question at just shy of 36 weeks gestation, and Leigh got straight on the phone to labour ward to let them know we would be coming in. He phoned my mum, too, to ask her to meet us there and look after our four year old. We didn’t wake him yet – despite the shock, a peacefulness pervaded that first hour of labour. I was determined not to panic, and I didn’t want to rush either. We had completed a hypnobirthing course two weeks before, and though there had been precious little time to embed the toolkit it had left us with there were a few things that kicked in straight away and really helped me feel calm, in control, and more than a little bit excited that we were going to be meeting our little one so much earlier than we’d thought. Whilst I pottered round our room making sure the hospital bag I’d packed ‘just in case’ that week contained everything it needed to, I listened to the playlist my yoga teacher had shared with us and switched on the diffuser so the calming scent of lavender and rose filled the space. As gentle surges began to rise in my belly I stopped and breathed through them – four counts in, eight counts out. It was around about then that I remembered I hadn’t washed the baby’s bedding yet – Leigh was beginning to suggest we should maybe think about waking Arthur and making a move, but I was insistent that we had to be prepared for his homecoming and loaded the machine between surges, intent on completing this simple task. By the time the washing was done, a simple breakfast of banana toast had been eaten, and Arthur was up and dressed it was close to 8am. The surges were coming every few minutes, and getting stronger each time. It seemed that this baby was not only unwilling to wait for his due date but would not be wasting much time in labour either. Leigh drove us to the hospital as my focus on my breathing became quieter and more intense. My mum met us in the car park and followed us in with Arthur to find a place to wait and make sure all was ok: by this time my concentration was elsewhere, and I was very glad that he was safe and happy, if no doubt a little bit perplexed by this peculiar start to our Sunday. On labour ward we were shown straight to a private room with a mural of the sea on one wall. This boded well, and added to the deep contentment I was holding onto at this point. In my first pregnancy, the thought of hospital had panicked me – an anxiety I had felt for much of this one too. The turnaround had come through those two days of immersion in hypnobirthing: we had discussed the beauty of a natural home birth of course, but all other eventualities had been covered as well, and I had left feeling that even if things didn’t happen quite as planned there was no reason why my birth experience should not still be a beautiful one. As it turned out that was possibly the most important lesson of all. My midwife was young and friendly. I was worried at first that she might be inexperienced, but her intuition was strong and I felt safe in her care. We discussed the possibility of transferring to the birthing pool, but as it turned out things moved a bit too quickly for that. I was still only four centimetres dilated, but the surges were coming strong and fast. Leigh set up the speaker so the music could continue to shape the mood, and filled the room with aromatherapy spray. As each surge rose up I found myself reaching out for the nearest surface to lean into, breathing through the pressure until the brief respite in between. 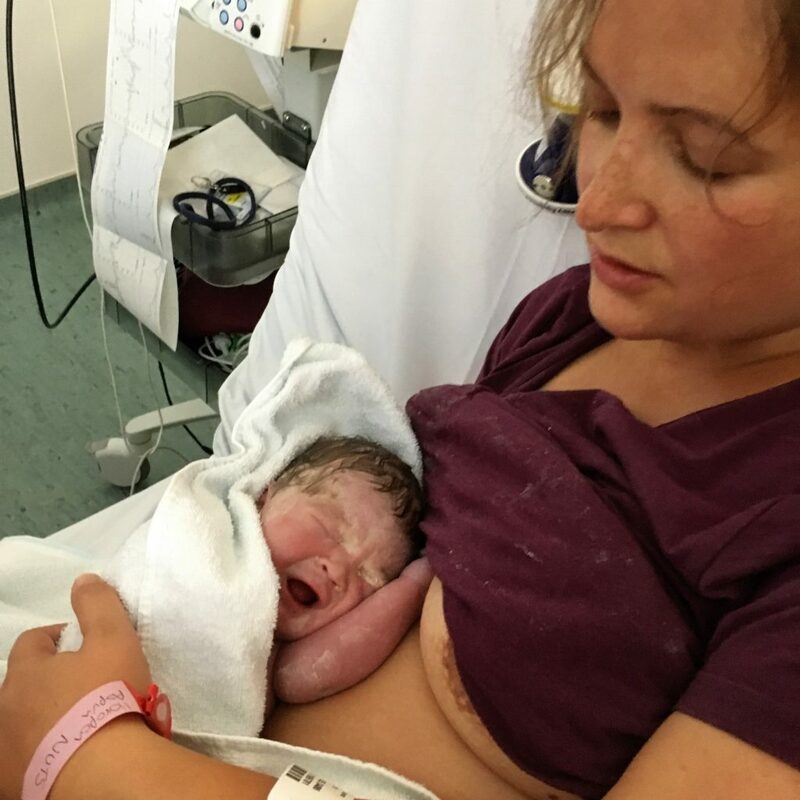 I remember around this point feeling a little disappointed that things were moving so fast – it might sound strange but the hypnobirthing preparation had left me looking forward to labour, to relishing the sensations as it progressed. The reality was that it was all a bit too intense for relishing – I hadn’t quite made the connection at this point that the intensity would likely mean that it really wouldn’t be long at all until we would meet our precious boy. There were some scary moments – like when the obstetrician was called in because our baby’s sats were dropping with each contraction. They shifted the monitoring from a band around my belly to a probe attached directly to his head in case it was my movement that was causing the drop. I never actually knew what the outcome was of that as soon afterwards things got considerably more intense. I had been mainly pacing up to that stage and moved to the bed once my legs became increasingly hard to control. I didn’t lie down – there had been a couple of times when I had been asked to for examinations and had growled at the absurdity of the idea. 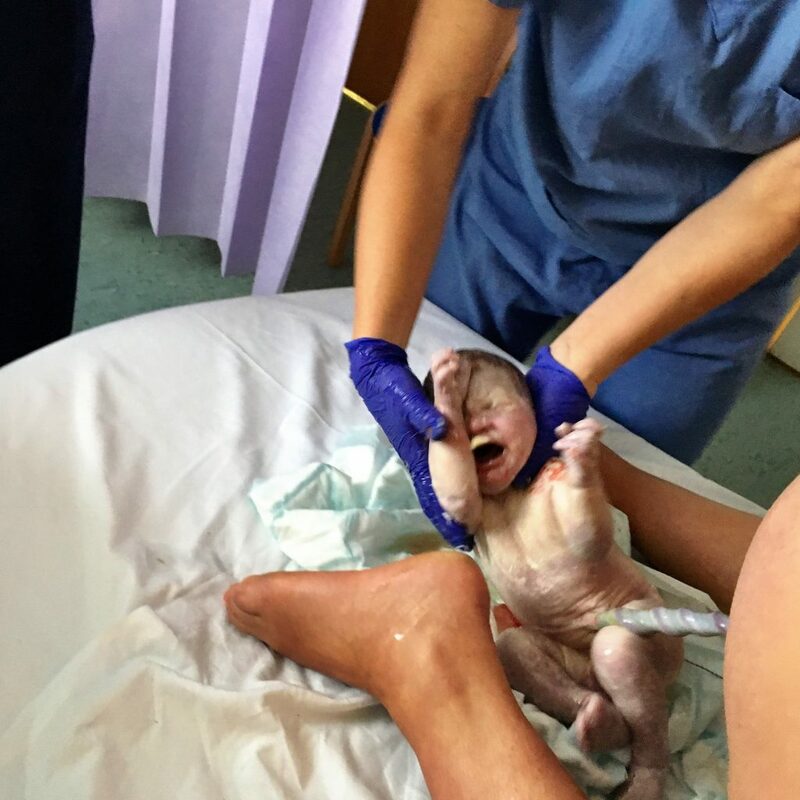 My body was determined to be upright, and with the help of Leigh and the midwife I found a position raised up on my knees leaning forwards against the back of the bed. By now my breathing was enhanced by gas and air – I had forgotten quite how delicious it was, especially as the tens machine we’d brought with us had failed so this was the first relief I had enjoyed from the growing intensity of the surges. I remember a moment when it all felt completely overwhelming. I found myself sobbing in between each surge, a total release of pent up emotion. I asked after Arthur then too, a flash of fear passing through me for my first born. I was soon distracted by his brother, who was well and truly on his way – the pressure increasing until my body began to push. I felt my baby’s head, a ring of fire which took me by surprise, and almost as soon as I had taken on board this sensation it was over. At 10.23 on that Sunday morning he arrived in the world. In that first glance he looked uncannily like Arthur – a smaller version, but his features and mop of dark hair just the same. It wasn’t Arthur though of course – it was our second son, still yet to be named, so tiny but so perfect. The midwives hovered ready to cut the cord, struggling to pass him to me as it was almost too short to facilitate that. The resuscitation trolley stood in the background, a reminder that with his early arrival things might not be entirely straightforward. His vital signs were strong though and I asked them to delay the cord clamping whilst he lay against my belly and I absorbed the wonder of this new addition to our lives. They gave us about fifteen minutes before they insisted he needed a more thorough check. Leigh cut the cord, and our baby was moved across to the trolley. He was doing great considering his early arrival, but they were still a little concerned about his breathing and transferred him up to the Special Care Baby Unit. It was a horrible wrench having him taken away – by far the most unnatural part of the whole process up to that point. I asked Leigh to message my mum, who was still lurking in the corridors with Arthur, and she took over guardianship of our littlest boy until we were able to be with him ourselves. Things were, unfortunately, getting a bit more complicated for me. My placenta was showing no sign of coming away from my uterus, despite a reluctant decision to accept the syntometrine injection. A second injection had no impact either, and it soon became clear that it would have to be removed manually. A theatre team were called in, and I was prepped for an epidural. I continued to breathe to dispel the panic which was beginning to bubble up despite my best intentions: the whole situation was just becoming increasingly surreal, and for the first time that day feeling like it was in danger of spiralling out of control. Leigh managed to levy his junior doctor credentials to accompany me to the operating room and I am so very grateful he did. He kept me calm, playing the music again which had seen us through to this stage and reminding me to focus on my breathing when I began to forget. The doctors and nurses started their work in a strangely jovial mood. This began to shift as time passed, and I could hear and feel the obstetrician struggling with my womb. There is no denying that it was decidedly unpleasant – not painful, but a seemingly never ending tussle which shifted my lower body around on the table. After almost an hour voices began to get more hushed, and my mind flew to worst case scenarios. I could feel myself descending into fear, but once again that hypnobirthing toolkit shone through and I became acutely aware that it was up to me to visualise a better outcome. 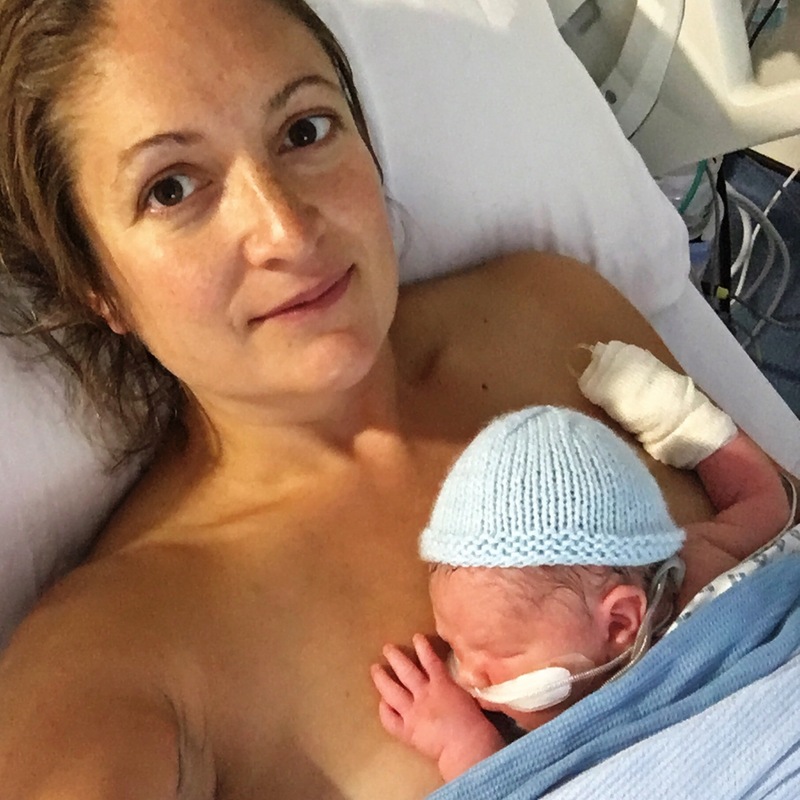 So I did – I thought of cuddles with my boys, and I saw my placenta separate itself safely from my uterus allowing my body to heal. A minute later the surgeon declared that he had succeeded in his task. The relief in the room was palpable. They kept me nearby for observation for a while, but before too long I was released to labour ward – and from there, finally, to SCBU. I saw my brave big boy in the corridor with my parents as my bed was wheeled through, and he joined me and Leigh as we went to find his baby brother. We were lucky that he was currently the only baby needing a high level of care so we could all crowd in to be together as a family for the first time. Despite the beeping machines and alien looking tubes surrounding him the nurse assured us our baby was doing well – and as soon as he was lifted from the incubator and placed against my chest I knew that everything was going to be just fine. For local mamas my wonderful pregnancy yoga classes were with Jess who I would heartily recommend. 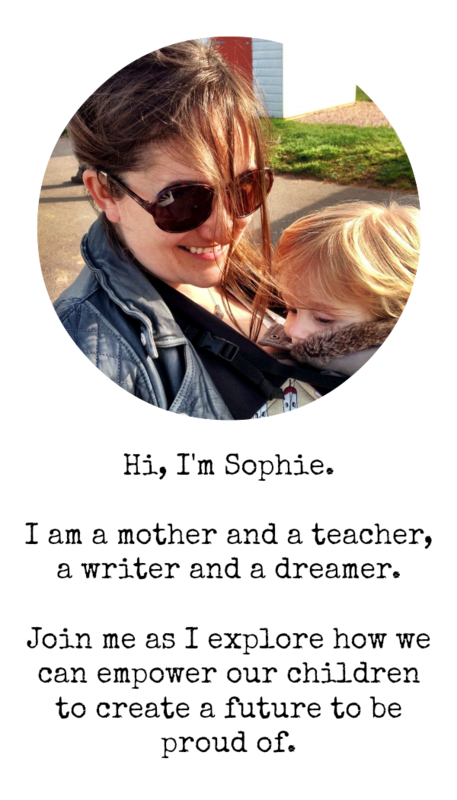 And if you are expecting a baby and can get to Devon, London or Birmingham then you should definitely check out Siobhan‘s fantastic hypnobirthing classes. I’m pretty convinced that without these two awesome ladies in my life this would have been a very different birth experience! Thank you! And congratulations on your pregnancy 🙂 I would really recommend hypnobirthing to help you hold on to that feeling of being in control – however the birth pans out. It made such a positive difference to me.